We’d love your help. Let us know what’s wrong with this preview of Thankful by Shelley Shepard Gray. New York Times bestselling author Shelley Shepard Gray captures the beauty, devotion, and warmth of Amish life in this engaging tale of family, commitment, trust, and love set in the beloved community of Sugarcreek. Christina Kempf has always known that God chose Aden Reese to be her husband. As children, he was there to save her when she fell through the ice, and he’s been by her side ever since. After his parents died in a car accident ten years ago, the Kempfs raised Aden as one of their own, and everyone sees Aden and Christina as brother and sister. But Christina has never given up hope that Aden will one day ask her to be his wife. Aden always planned to court Christina. But losing his mother and father changed everything—except his love for her. Her parents generously welcomed him into their home and treated him like a son. He can’t betray their kindness by admitting his feelings for the girl who is like a sister . . . yet so much more. Pressured by her parents to court, Christina begins to accept the attentions of Sugarcreek’s young men, and now, Aden must make a choice. Will he stand by and watch the love of his life slip away? Or will he risk losing the love and trust of the family he holds dear to tell Christina how he truly feels? Thankful includes a P.S. section with additional insights from the author, background material, suggestions for further reading, and more. To ask other readers questions about Thankful, please sign up. Shelley Shephard Gray has written another masterful novel. Two of the central characters in this book are Christina Kempf and Aden Reese, both strong but also somewhat vulnerable. They are bound by friendship and family but also by the love they have for each other. Shelley has created new characters as well as bringing back character that we have known and loved since the Seasons of Sugarcreek series. The characters are endearing and engaging; important to the story and some of them are at a cro Shelley Shephard Gray has written another masterful novel. The characters are endearing and engaging; important to the story and some of them are at a crossroads in life where they must make a big decision that will affect not only themselves but others in their lives, too. In the inimitable style of Shelley Shephard Gray the characters are brought to life by her ability to make you feel as though you are at The Sugarcreek Inn eating pie and having a cup of coffee with the staff and the customers. Or walking through the snow and even ice skating! She creates characters that are realistic, charming, and sometimes fragile but ones you always want to get better acquainted with. Shelley takes us through the heartache of a childless couple desperately wanting a baby, new relationships and always does it seamlessly. I absolutely love love love the Return to Sugarcreek series! I loved book 1 “Hopeful” so much and wasn’t sure what to expect for the second book. Let me say it exceeded all of my expectations! I immediately fell in love with Christian and Aden. I love that they struggled in their feelings for each other…I just love stories like this! There is also the story of another couple hoping to adopt a child….there were so many ups and downs along the way for them. Thankful is appropriately titled, because th I absolutely love love love the Return to Sugarcreek series! Thankful is appropriately titled, because that is exactly what the take-away from this book was for me personally. Things happen in our lives, some good, some bad…but through it all, we can always find something (maybe very small) to be thankful for. I cannot wait for the next book in the series!!! Though this is a series, you can read and enjoy Thankful as a standalone. This was a very sweet romance and a quick read. Christina and Aden are raised as siblings but felt differently for each other. There were also two other stories interwoven in the pages of Aden and Christina's romance. Jana worked at the Inn Christina works at and she's looking for mostly retiring, and Judith is wanting to adopt a baby but might ended fostering one. A very quick read, short and satisfying. I enjoyed getting to know Christina and Aden and as theirs was the main story, it was good. This was a very sweet romance and a quick read. Christina and Aden are raised as siblings but felt differently for each other. There were also two other stories interwoven in the pages of Aden and Christina's romance. Jana worked at the Inn Christina works at and she's looking for mostly retiring, and Judith is wanting to adopt a baby but might ended fostering one. A very quick read, short and satisfying. This book seemed a bit lighter than the last book in this series. However it does reunite us with familar faces from Book One. I enjoyed the story, but often felt myself getting frustrated with the two main characters. If they had just communicated it would have been better. I loved the side story of Jana, in fact I liked her story better than I did Christina's and Aden's. Overall a good fast read, a great way to spend an afternoon. 4 stars from this reviewer. This book was provided for review p This book seemed a bit lighter than the last book in this series. However it does reunite us with familar faces from Book One. This is the story of Christina Kempf and Aden Reese. Aden saved Christina when they were children. The Kempf family took Aden in when his parents died in an accident. strong feelings that they haven’t admitted to the other. What a sweet romance story! I was rooting for them to finally kiss throughout the story. The suspense was killing me! And I love the fact that Aiden helped her face her fears too. Great story!! I can honestly say that any book that I see that is written from Shelley Shepard Gray will be one that will find a permanent home in my growing collection of her books. In her latest novel from the Return to Sugarcreek Series, Thankful compromises a couple of stories with being thankful as their central theme. My favorite is that of Christina Kempf and Aden Reese, who experienced a tragedy one day when ice skating, as Christina fell through the ice. Aden successfully saved her but would be the o I can honestly say that any book that I see that is written from Shelley Shepard Gray will be one that will find a permanent home in my growing collection of her books. In her latest novel from the Return to Sugarcreek Series, Thankful compromises a couple of stories with being thankful as their central theme. My favorite is that of Christina Kempf and Aden Reese, who experienced a tragedy one day when ice skating, as Christina fell through the ice. Aden successfully saved her but would be the one link that keeps them from moving forward in life. Aden joined the Kempf family when he lost his parents as a child and has spent the last ten years growing up feeling like part of the family. Only the one thing that hasn't changed is his feelings for Christina go deeper than brotherly affection. But how can he find a way to court her while still living under the same roof where her family views him as more of a brother to Christina than a suitor? Christina spends her time working as a server at the Sugarcreek Inn ran by Jana Kent. It's the promotion she's been waiting for and Jana is hoping to make some changes in her own life. Running the restaurant since her husband's death has left her with virtually no time for anything else except wondering how she will make ends meet. She doesn't even have time to visit her now grown children, since there is no one else to help her manage it. Her friend Pippa suggests that she might be ready to find a partner to share the burden of running the restaurant as well as give her some extra time for a life outside of her job. It seems like the ideal suggestion especially when she notices the attention of Ross Capshaw, the newest officer to join the police force in Sugarcreek and it seems he is just as interested in her as well. Judith Knox has been dreaming of being a mother since she married Ben but it seems as it God has other plans. When she finally comes to terms with not being able to conceive, Ben suggests that they consider adoption. Just when she thinks all the pieces are going to fall into place and their social worker, Bernie finds them a child, she learns that he is only available to foster. The baby's mother is serving time in prison and she needs to find someone to care for him as soon as possible. Just as soon as Judith and Ben agree they are in for another surprise, the baby Bernie has in mind for foster is an African American baby named James. Judith had hoped she wouldn't have to answer any questions about her decision to foster over adopt and now it's going to be quite apparent that the baby isn't Judith and Ben's. But a mother's love shows that love goes beyond the color of our skin! Shelley Shepard Gray lives in southern Ohio and writes full time. A busy wife and mother of two, she spends her days writing and keeping track of her two teenagers. Her two dogs keep her company when she writes in her basement. Shelley enjoys writing about the Amish and visits Amish communities in Adams and Holmes counties several times a year. When not spending time with her family or writing, she serves on several committees in her church. She also bakes a lot, loves coconut cream pie, and will hardly ever pull weeds, mow the yard, or drive in the snow. Shelley also spends a lot of time on line! Please visit her website, www.shelleyshepardgray.com to find out her latest news...or become her friend on Facebook. Thankful, comes in many shapes and sizes as we learn in the latest addition to the Return To Sugarcreek series. Cristina has had special feeling for her adopted brother Aden for a long while. He too feels the same way. The only ones who don't know is Christina's parents. Aden must decide if he will allow Christina and the promise of her love to slip through his fingers or will he face whomever he must to join with her forever. This is not the only story of love and being thankful that is going on in this part of the series, there is also another story that will tear at your heart. There is a loving couple that can't have children of their own. Soon they start fostering children in the hopes of one day finding one of their very own. But something unexpected happens, but instead of rejecting the baby they embrace him. They embrace him so much so that they aren't too sure they will be able to give him up. A touching story of love, grace, and thankfulness that reaches across strong barriers to prove God's love for everyone, no matter the situation or the cost. **Disclosure** This book was sent to me free of charge for my honest review from Litfuse Publicity. Thankful is the second book in Shelley Shepard Gray's latest series, Return to Sugarcreek. As a huge fan of Amish Fiction and having read the first book in this series I was excited to have the opportunity to read this book. As children, Aden Reese saved Christina Kempf when she fell through the ice one winter day and since then the Kempfs gave him a place to live and raised him along with their other children. Everyone believes Christina and Aden are brother and sister except for Christina who Thankful is the second book in Shelley Shepard Gray's latest series, Return to Sugarcreek. As a huge fan of Amish Fiction and having read the first book in this series I was excited to have the opportunity to read this book. As children, Aden Reese saved Christina Kempf when she fell through the ice one winter day and since then the Kempfs gave him a place to live and raised him along with their other children. Everyone believes Christina and Aden are brother and sister except for Christina who truly loves Aden and wants to be his wife. Aden loves Christina too and wanted to court her but once his parents died and he moved in with the Kempfs he felt it would be disrespectful to the Kempfs for him to court her. Now Christina is accepting invitations from other young men and Aden isn't sure what to do because he doesn't want to lose her but still doesn't want to hurt the only people who have been family to him. In this book, there are a few different stories going on with Christina and Aden's being the main one. Also Judith and Ben are back going through the adoption process. They have the opportunity to foster a baby and after thought and prayer they agree to do foster care to the precious child. What they did not know was that James (the baby) is black until the social worker brings him there. Judith and Ben bond with James instantly and find themselves wanting to adopt him. Also there is Jana, who runs the local restaurant who is a widow and has made the restaurant the only thing in her life. She realizes that she cannot keep it up and her best friend buys into the restaurant to be a partner, which gives Jana the time to find herself and what she wants with her life. 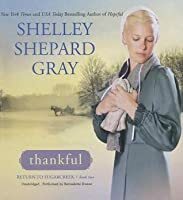 I enjoyed Shelley Shepard Gray's Thankful. First and foremost Amish Fiction books are my favorite and Shelley Shepard Gray is on my must read list. Shelley Shepard Gray writes with authority on the Amish ways, Sugarcreek and other Amish cities, running a restaurant, adoption, and the Amish Faith. The three stories are bound together by the main idea of being thankful. As I read this book, it really challenged me to see all the things in my life that I need to be thankful for and how focusing on that does make you truly thankful. I found myself needing tissues as I read because so much in this story touched my heart. I found myself unable to put this book down until the end. Shelley Shepard Gray really puts her readers right in the middle of the story to watch the whole thing unfold, feeling like I am right there with the characters. The characters are great and I enjoyed them, meeting new characters and finding out about old friends from the previous book. I recommend this book to anyone who enjoys Amish Fiction, you will not be disappointed. I look forward to reading the next book in this series. “Christina Kempf has always known that God chose Aden Reese to be her husband. As children, he was there to save her when she fell through the ice, and he’s been by her side ever since. After his parents died in a car accident ten years ago, the Kempfs raised Aden as one of their own, and everyone sees Aden and Christina as brother and sister. But Christina has never given up hope that Aden will one day ask her to be his wife. Spiritual Content- Psalm 50:15 at the beginning; Prayers, Talks about God, His Will & Trusting Him. Negative Content- Minor Cussing including: a form of ‘sissy’, and a ‘shoot’. Sexual Content- A few (not-detailed) kisses. Probably best for Older 13s and up…for those of y’all who go “Awwww!” at the sweet parts (when the couple teases each other, blushes and sweet things like that). See y’all on Monday for another Two new reviews! Follow us on Instagram ( @lindseyfrombfcg ) to see behind the scenes and seek peeks of BFCG! *BFCG may (Read the review to see) recommend this book by this author. It does not mean I recommend all the books by this author. This is the second book in the Return to Sugarcreek Series by Shelley Shepard Gray and it is another winner. The theme is thankful and we learn a lot about how the characters learn to be thankful. It is also a story about adoption and fostering a child, specifically a child of a different race. Aden was adopted into the Kempf family and as the children grow into adults, he realizes that his love for his adopted sister Christina is more than that of a sibling. Early on, he saves Christina when sh This is the second book in the Return to Sugarcreek Series by Shelley Shepard Gray and it is another winner. The theme is thankful and we learn a lot about how the characters learn to be thankful. It is also a story about adoption and fostering a child, specifically a child of a different race. Aden was adopted into the Kempf family and as the children grow into adults, he realizes that his love for his adopted sister Christina is more than that of a sibling. Early on, he saves Christina when she falls through the ice and the two form a special bond. Fighting to ignore this feeling, Aden decides to move away. Christina has had nightmares and fears ever since her accident on the ice and is fearful of many things, but together they finally realize they have to face their fears and be thankful for each other. Judith and Ben are unable to have children and want to adopt. But as the adoption process is slow, they are asked to foster a baby of a woman who is in prison. They agree but do not realize the child is black until the social worker brings him to them. Judith becomes attached and is afraid she will not be able to give the baby up when the baby's aunts want to gain custody. Summoning up all their courage, Judith and Ben venture to the prison to meet James' mother to plead to be able to keep James. His mother immediately sees the love they have for their child and is thankful that they are willing to love him and give him a home. Judith and Ben are thankful that God has brought this special baby into their lives and while they wish they could keep him, are thankful that his mother trusts them with her child. James' mother signs the papers so they will not lose him to his aunts who cannot provide the love and safety that he needs. Jana is the owner of the Sugarcreek Inn, a widow and a slave to her business until she realizes that she has to let go. She sells a majority interest in the Inn and then meets a wonderful man, a new policeman in town. Jana is thankful that she has realized that she has to live her life, stop working so hard and move on. Her children are not so sure but when they visit Jana, they see how happy she is with her new life and are thankful. Shelley Shepard Gray in her new book, “Thankful” Book Two in the Return to Sugarcreek series published by Avon Inspire takes us into the lives of Christina Kempf and Aden Reese. Christina Kempf has always felt that God chose Aden Reese to be her husband. When they were children, Aden was there to save her when she fell through a patch of thin ice, a Shelley Shepard Gray in her new book, “Thankful” Book Two in the Return to Sugarcreek series published by Avon Inspire takes us into the lives of Christina Kempf and Aden Reese. Christina Kempf has always felt that God chose Aden Reese to be her husband. When they were children, Aden was there to save her when she fell through a patch of thin ice, and he’s been by her side ever since. After his parents died in a car accident ten years ago, the Kempfs raised Aden as one of their own, and everyone sees Aden and Christina as brother and sister. But Christina has never given up hope that Aden will one day see her as the perfect woman for him . . . and ask her to be his wife. Despite what his heart wants, Aden can’t find it in himself to repay the Kempfs’ kindness with an admission that his feelings for Christina have only ever been romantic. But when she’s pressured by her parents to court more broadly, Christina begins to accept the attentions of Sugarcreek’s young men. Now Aden must make a choice. Will he stand by and watch the love of his life slip away? Or will he risk losing the love and trust of the family he holds dear to tell Christina how he truly feels? I made a mistake. I did not read the first book in this series, “Hopeful”. But that is okay as Ms. Gray did a wonderful job in keeping this a stand alone within the series. It helps if you know what happened in the first book however it does not detract from the current goings on. I do not believe that I have ever read a plot like this one. Aden is in love with Christina and she in love with him. Due to tragedy Aden moves in with the Kempfs and is seen as part of the family. Now Aden is torn as Christina is forced to court but he doesn’t want to seem disloyal to the family. This is an exceptional story with exceptional characters that you care for and so want them to get together. I liked it a lot and am so looking forward to the next book in this series. Shelley Shepard Gray has written a fantastic new installment in her Return to Sugarcreek series. The saga continues with Christina and Aden trying to determine how to carry their relationship into adulthood. There's an overarc-ing theme that's even greater than romance, though, and that's ... overcoming? Triumph? Peace? I'm not sure of the right word, but though it's been ten years since Aden rescued Christina from the icy pond, neither of them have ever talked through what really happened that Shelley Shepard Gray has written a fantastic new installment in her Return to Sugarcreek series. The saga continues with Christina and Aden trying to determine how to carry their relationship into adulthood. There's an overarc-ing theme that's even greater than romance, though, and that's ... overcoming? Triumph? Peace? I'm not sure of the right word, but though it's been ten years since Aden rescued Christina from the icy pond, neither of them have ever talked through what really happened that day - or dealt with the emotions stirred up by the fall. This was really the hook of the entire plot for me: would they be willing to face their fears, dig into deeply buried emotions, and find healing so that they could charge off into uncharted romantic territory? I really liked Aden and Christina. There was something vulnerable about them, aside from their buried pain, that made them extremely likeable. Mix in that they're friendly, kind, and generous, and you had characters destined to be winners. This was not an action-packed story. There were no drive-by peachings, nobody was seriously hurt, there were no natural disasters; but instead it was a story fraught with emotional drama. Those things may be easier to write, because while the devil is in the details there are lots of details to describe. The author has myriads of concrete things to tell the reader all about. Instead, Thankful was charged with emotional electricity through which each character in the story learned to be thankful for what s/he already had. To find the peace in the every day. This is more difficult, because to explain those emotions and describe them realistically you must first have a full grasp of the entire emotional scale. You need to feel the pain, understand the hurt, and see the path to healing and peace. Isn't that important for us all? Thankful is the second story in the Return to Sugarcreek series. Just like all of the other books by Shelley, I loved reading it and was sad when it was finished. Christina and Aden have known each other since they were young children. Aden was taken in by Christina's parents, and to everyone else they are just like brother and sister. If life was only that simple!! Christina and Aden have a beautiful connection that goes beyond just mere friendship, but even they can't seem to let each other kn Thankful is the second story in the Return to Sugarcreek series. Just like all of the other books by Shelley, I loved reading it and was sad when it was finished. Christina and Aden have known each other since they were young children. Aden was taken in by Christina's parents, and to everyone else they are just like brother and sister. If life was only that simple!! Christina and Aden have a beautiful connection that goes beyond just mere friendship, but even they can't seem to let each other know how they truly feel. Once again, Shelley Shepard Gray writes a beautiful love story that has you cheering for the victories and also sensing the frustration when life just doesn't go as you planned. Even though this story belongs to Christina and Aden, you will become acquainted with Jana. She is the owner of the Sugarcreek Inn. She is working to keep her husband's dream alive, but now that her husband has passed, she is ready for what her life now has to offer. Enter the handsome policeman, Ross. Is he ready to make this journey with her? And, Judith and Ben, who are familiar faces with the Sugarcreek books. They have now come to terms with the fact that they might never have their own baby. With much love to offer, they decide it would be worth it to become foster parents to James. Thankful is a story about God's timing and how important it is in our everyday life. When we leave our problems and circumstances in the hands of the One who is able to make everything work out we find that we have a lot to be thankful for. In the story of all the characters in Thankful, we see that this is case. Thankful is a wonderfully written story of the lives of two young adults (Aden & Christina), a married couple (Ben & Judith), and the English owner of Sugarcreek Inn (Jana). Aden & Christina (Christy as he calls her) are life-long friends and neighbors. Aden’s parents, who had always been too busy with their furniture business to pay him any attention, died in an accident when he was fourteen and Christina’s family took him in and loved and treated him like one of their own. No one kn Thankful is a wonderfully written story of the lives of two young adults (Aden & Christina), a married couple (Ben & Judith), and the English owner of Sugarcreek Inn (Jana). Aden & Christina (Christy as he calls her) are life-long friends and neighbors. Aden’s parents, who had always been too busy with their furniture business to pay him any attention, died in an accident when he was fourteen and Christina’s family took him in and loved and treated him like one of their own. No one knew, including Aden & Christiana, that they loved each other. Living in the same house, the two were often referred to as siblings. Judith had suffered a miscarriage and was told she couldn’t have children. She and her husband Ben were in the middle of the adoption process when the social worker asked them to consider being foster parents for a newborn until his mother got out of prison. Jana was a widow who spent all her time working. Her children were grown and lived away. They talked on the phone and visited when they could but still Jana was lonely at home and considered the women at the Inn her family. One day she met the new policeman in town (Ross Capshaw). They all have much to be THANKFUL for but you’ll have to read this wonderful book by New York Times and USA Today Bestselling Author Shelley Shepard Gray to find out what….you won’t be able to put it down!! Thankful is the second book in the Return to Sugarcreek series. Once again Shelley Shepard Gray has written a story that will touch your heart, and pull you right into the lives of her characters right from the very first page when we meet Aden Reese and Christina Kempf. From the moment Aden saves Christina's life she knows he is the one for her, but because her parents have taken Aden in and raised him as one of their own, they both struggle with their feelings for one another as they are raise Thankful is the second book in the Return to Sugarcreek series. Once again Shelley Shepard Gray has written a story that will touch your heart, and pull you right into the lives of her characters right from the very first page when we meet Aden Reese and Christina Kempf. From the moment Aden saves Christina's life she knows he is the one for her, but because her parents have taken Aden in and raised him as one of their own, they both struggle with their feelings for one another as they are raised as siblings. We get to re-visit with Ben and Judith Knox and learn more about their struggles of not being able to have children and their decision to foster a child, and something a little surprising that I was not expecting was we get to learn more about Jana Kent who is the owner of Sugarcreek Inn and how certain events in her life have brought her to where she is today and some of the things she is struggling with. Thankful is a story about facing fears and being able to push through them whether those fears are founded from heartache, pain, or fears that they face every day. Some of them are faced alone and some together, but once they have faced their fears they all find that they are "Thankful" for everything that God has blessed them with. Thankful is a beautiful heartfelt book. I enjoyed getting lost in Sugarcreek again. This book definitely is worth the read. I really enjoyed this sweet love story! There were some cute moments as Aden tried to deny his feelings and Christina felt sure he didn't have romantic feelings towards her. The description on the back is a little misleading as I didn't think her parents pressured her to court but she felt it would help to forget Aden. I liked the other two story lines, too, as an Amish couple decide to be foster parents to a baby whose mom is in prison and an English widow who owns a restaurant realizes she nee I really enjoyed this sweet love story! There were some cute moments as Aden tried to deny his feelings and Christina felt sure he didn't have romantic feelings towards her. The description on the back is a little misleading as I didn't think her parents pressured her to court but she felt it would help to forget Aden. I liked the other two story lines, too, as an Amish couple decide to be foster parents to a baby whose mom is in prison and an English widow who owns a restaurant realizes she needs to get a life outside of work and just might find love again. I also liked how one character was realizing everything wasn't all about her and Christina was trying to overcome her fear of the icy pond where she fell through. One thing I found a little distracting is that sometimes a sentence doesn't seem to fit or make sense to what's happening. I loved the theme of thankfulness! It's so easy to focus on the negative and what we don't have instead of all the blessings we do have. I loved how this book showed characters learning to be thankful in spite of difficult circumstances. I'm really loving this series where each book can stand alone, but you won't want to miss one! I feel in love with some of these characters in the first book in this series Hopeful, and Thankful the second book, does not disappoint. We are reunited with Judith and Ben and their desire to have a child, and how their lives become full of joy. The main characters in this book are Christina Kempf and Aden Reese; these two have been raised together as brother and sister. Now how can that go further and they fall in love? When you are raised as siblings and under strict religious circumstances, I feel in love with some of these characters in the first book in this series Hopeful, and Thankful the second book, does not disappoint. We are reunited with Judith and Ben and their desire to have a child, and how their lives become full of joy. The main characters in this book are Christina Kempf and Aden Reese; these two have been raised together as brother and sister. Now how can that go further and they fall in love? When you are raised as siblings and under strict religious circumstances, how can they come together in any other way? I so enjoyed this return visit and the author has done a wonderful job making me feel like a part of the community. We also have a side story of Jan who is the owner of the Sugarcreek Inn, where Christina works. She is at a crossroads in her life, and we get to enjoy some the things that come wrapped in roses to her. I never wanted this to end, but am so happy that the third book in this series, Joyful, which is scheduled for release in September. Don’t miss this wonderful read, am so glad I was blessed to have read it! I received this book through Edelwiss, and the publisher Avon Inspire, and was not required to give a positive review. Christina Kempf surrendered her heart to Aiden Reese when they were young children. He was her hero, best friend and protector. He was taken in by her family after the tragic death of his parents. They have not revealed the depth of their love for for each other fear the other only carries the love of a sibling. Christina makes the move to court other young Amish men at the persistence of her parents. This rips a hole in Aiden's heart. He is afraid of loosing her but also fears loosing the respe Christina Kempf surrendered her heart to Aiden Reese when they were young children. He was her hero, best friend and protector. He was taken in by her family after the tragic death of his parents. They have not revealed the depth of their love for for each other fear the other only carries the love of a sibling. Christina makes the move to court other young Amish men at the persistence of her parents. This rips a hole in Aiden's heart. He is afraid of loosing her but also fears loosing the respect of Christina's parents if he were to reveal his true feelings for their daughter. This story touched my heart to the point I had to keep a box of tissues in my lap while reading the book. In fact it did not take me long to read the book because I refused to put the book down until the very end. This story had so much to offer me as a reader. It was tragic, romantic and it had dedication to family and community. Lessons were learned in trusting God without fear and to pray He for Him to lead us to the life He has planned for us. I rated this book a 5 out of 5. I received a free copy of this book from HarperCollins /Avon Inspire/Litfuse Publicity Group for an honest review. I was lucky enough to read book one, Hopeful, and I am so glad that I was able to read this book as well. This story made me think about how my parents had an open door policy and they accepted who ever came through their door. Unless they got between us siblings. I also thought about how my parent knew my siblings spouses, and my spouse, before we did. One of my brother in laws was my mom's paperboy, and the other was her boss! I wonder if when they had them as friends if they wanted to have th I was lucky enough to read book one, Hopeful, and I am so glad that I was able to read this book as well. This story made me think about how my parents had an open door policy and they accepted who ever came through their door. Unless they got between us siblings. I also thought about how my parent knew my siblings spouses, and my spouse, before we did. One of my brother in laws was my mom's paperboy, and the other was her boss! I wonder if when they had them as friends if they wanted to have them as kids in law. However this story is a little different then mine, because Aden lived with Christina's parents and they treated them like brother and sister. It was interesting to read how the other characters in the book were oblivious to how they felt about each other. There was also an incident that involved ice that was a major thread to their relationship. I really enjoyed how Aden was there for Christina and how he was timid about his feelings just like she was. It was also amusing to read about Christina when she started to court other men! I am giving this book a 5/5. I was given a copy to review, however all opinions are my own. In Shelley Shepard Gray's Thankful, the reader is drawn back to Sugarcreek. At a young age, Christina Kempf and Aden Reese knew in their hearts, they would one day be together. After an accident on the ice, when Aden saves Christina and the death of his parents, it seems they had misunderstood what God was telling them. At the same time Aden and Christina are working through their tests in life; Judith and Ben Know, waiting to adopt a child have been asked to be foster parents for a baby. Will the In Shelley Shepard Gray's Thankful, the reader is drawn back to Sugarcreek. At the same time Aden and Christina are working through their tests in life; Judith and Ben Know, waiting to adopt a child have been asked to be foster parents for a baby. Will they be able to care for this little one, knowing he will return to his mother once she is released from prison? What other surprises and tests might be placed in their lives with this foster child? Jana Kent, owner of the Sugarcreek Inn, is ready to move on years after her husband's death. Will her children support her? How will she do this? This is the first Shelley Shepard Gray book I have read. I really liked her writing style. It flowed very well, was smooth and easy to read. I loved the plot of the book, and the underlying message. This is the second book in the series, but it didn't feel like I was missing information. Overall I enjoyed the book. However there were a few things that didn't allow me to give it a higher rating. It felt too short. As I stated I like the plot, but it felt shallow. I kept wanting her to dive deeper This is the first Shelley Shepard Gray book I have read. I really liked her writing style. It flowed very well, was smooth and easy to read. I loved the plot of the book, and the underlying message. This is the second book in the series, but it didn't feel like I was missing information. Overall I enjoyed the book. However there were a few things that didn't allow me to give it a higher rating. It felt too short. As I stated I like the plot, but it felt shallow. I kept wanting her to dive deeper into the story and the characters. There was a subplot that seemed misplaced. Maybe it is a continued subplot from the first book. If that is the case, this point is a non-issue. The last thing that was a bit of a negative for me was the heroine. She was likable, yet she had moments of being very manipulative. This in itself wouldn't have bothered me, except she didn't "grow" out of it. I would have liked to have seen her grow beyond her need to manipulate. I did enjoy the book and will definitely be reading more by Shelley! I know she has many books, and I am anxious to dive into more of them. I absolutely loved this story. It has been a long time since a story pulled on my heartstrings and this one captured me from page one. Aden and Christina have loved each other since they were children, but an accident has placed a barrier between them. Will they learn to overcome the obstacles or will they continue through life without confessing their love? Judith and Ben have wanted a child of their own for a long time, but circumstances have prevented it from becoming a reality. Can they lea I absolutely loved this story. It has been a long time since a story pulled on my heartstrings and this one captured me from page one. Judith and Ben have wanted a child of their own for a long time, but circumstances have prevented it from becoming a reality. Can they learn to love a foster child and provide him a stable home even though they might lose him in the end? With the Lord's guidance they weather the storm and decide with His help, they can withstand anything. Jana, the owner of Sugarcreek Inn, has been a widow for twelve years. Will she finally be able to find love? Shelley Shepard Gray has written a moving story that will capture your heart. Once I started reading this book I couldn't put it down. I was sad when the story ended, because I wanted to remain immersed in the character's lives a little while longer. This book is definitely a winner. I love visiting Sugarcreek! Both Christina and Aden have always expected to be together. When Aden's parent's die and Christina's family takes him in as their own, that hinders anything but sibling love. Doesn't it? As they get older, Christina is pressured into courting and both must make decisions that will affect them and their family. I love the way this author writes. Getting to go back and see the people we've already met in this place is probably one of my favorite parts. Christina and Ade I love visiting Sugarcreek! Both Christina and Aden have always expected to be together. When Aden's parent's die and Christina's family takes him in as their own, that hinders anything but sibling love. Doesn't it? As they get older, Christina is pressured into courting and both must make decisions that will affect them and their family. I love the way this author writes. Getting to go back and see the people we've already met in this place is probably one of my favorite parts. Christina and Aden's bond is special and I love the way it was done. Christina felt the pressure from her family to court. Aden has always loved her and wanted to be with her but being raised as her brother brings problems and mixed feeling about courting her. I rate this a 5/5. I completely enjoyed the book and can't wait to visit Sugarcreek again. Shelley Shepard Gray has woven another heartwarming tale of the people of Sugarcreek. With characters you like as soon as you meet them and situations relatable to both Amish and English life this is a five star read. Christina and Aden have been friends since childhood. Aden is adopted by Christina's parents after his are killed and this changes the dynamic of their friendship as they are often considered siblings. The two struggle with their feelings for each other. There are also two other sto Shelley Shepard Gray has woven another heartwarming tale of the people of Sugarcreek. With characters you like as soon as you meet them and situations relatable to both Amish and English life this is a five star read. There are also two other stories going in this book. Judith and Ben are going to become foster parents and Jana Kent, owner of the Sugarcreek Inn, is making changes in her life. Second in the Return to Sugarcreek Series, "Thankful" by Shelley Shepard Gray continues to move the genre of "Amish" stories into the real, modern world. This time, she takes on the stories of four different people and the way they make decisions to move forward in their lives. She deals sensitively with the brokenness of being an orphan, a widow, a childless couple, and much more. Each person must decide whether to continue to be afraid and stand still, or be brave enough to move forward, trust Second in the Return to Sugarcreek Series, "Thankful" by Shelley Shepard Gray continues to move the genre of "Amish" stories into the real, modern world. This time, she takes on the stories of four different people and the way they make decisions to move forward in their lives. She deals sensitively with the brokenness of being an orphan, a widow, a childless couple, and much more. Each person must decide whether to continue to be afraid and stand still, or be brave enough to move forward, trusting God and themselves with each shaking step. Aden and Christina have been raised in the same home for years, but both do not have a sibling affection for each other. Aden feels he is Christina's protector, and Christina feels as though as is a young woman who doesn't need protection. Ben and Judith Knox(fans of the Seasons of Sugarcreek series will remember these characters) have been praying for a child to love. Now, they may have the ability to be a foster parent to a newborn, but will they be able to love a child that is only in their ho Aden and Christina have been raised in the same home for years, but both do not have a sibling affection for each other. Aden feels he is Christina's protector, and Christina feels as though as is a young woman who doesn't need protection. Ben and Judith Knox(fans of the Seasons of Sugarcreek series will remember these characters) have been praying for a child to love. Now, they may have the ability to be a foster parent to a newborn, but will they be able to love a child that is only in their home for a short time. Librarian Note: AKA Shelley Gray (Western Romance). Shelley Shepard Gray has published over seventy novels. She currently writes Amish romances for Harper Collins, Kensington, and Simon & Schuster and contemporary women’s fiction for Blackstone Publishing. Her novels have been Holt Medallion winners and Inspirational Readers Choice and Carol finalists. Shelley’s novels have appeared on both the Librarian Note: AKA Shelley Gray (Western Romance). Her novels have been Holt Medallion winners and Inspirational Readers Choice and Carol finalists. Shelley’s novels have appeared on both the New York Times and USA Today bestseller lists. Her novels have been highlighted in the Philadelphia Enquirer, Washington Post, Time Magazine, and USA Today. She has also been interviewed on NPR as well as numerous regional radio stations. Before writing romances, Shelley lived in Texas and Colorado, where she taught school and earned both her bachelor’s degree in English literature and elementary education and later obtained her master’s degree in educational administration. She currently lives in Colorado Springs and writes full time. Shelley is married, the mother of two young adults, and always has a dachshund by her side. She is an active member of her church, on Facebook and on Twitter. She also has a website, www.shelleyshepardgray.com.